Your gums are an important part of your smile and your overall health. They help protect the sensitive roots of your teeth and the ligaments that hold them in place. When bacteria, plaque, or food debris accumulate along the gumline — which is associated with improper oral care, lifestyle factors like smoking, and genetic predisposition — the gums can become infected. 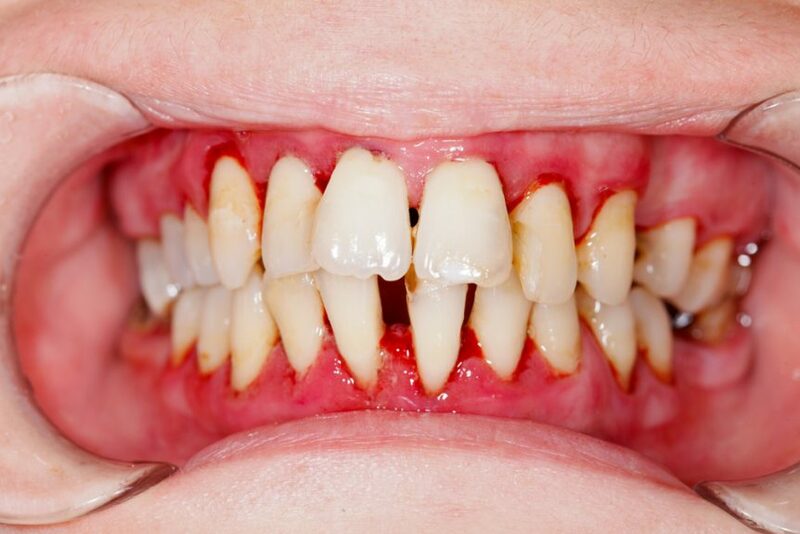 This type of infection is called gum disease or periodontal disease, and it can be far more dangerous than many people think. Over the years, it has become increasingly apparent to dental professionals that gum disease affects far more than just your mouth. In fact, scientific research has linked gum disease to some serious systemic diseases and medical conditions that may surprise you. Keep reading to learn more. While a causal link has not been established, NIH research has shown that gum disease can be linked to heart disease. Researchers believe that inflammation may be the linking factor between gum disease and an increased risk of cardiovascular disease. Because they share certain risk factors, periodontal disease may also worsen certain existing heart conditions. Additional NIH studies have shown that the types of oral bacteria found in gum disease can travel through the body and trigger inflammation that may lead to the formation of arterial plaque. For example, oral bacteria has been found in arterial plaque deposits in some people with atherosclerosis. These deposits can clog arteries, causing them to narrow or close entirely which can in turn lead to a heart attack. Because they are more prone to infections overall, people living with diabetes may be more likely to develop gum disease. As a matter of fact, gum disease is a relatively common complication of diabetes. When present, gum disease can increase blood sugar and cause other complications for diabetics. This is especially true of people who have uncontrolled diabetes. We all know that a stroke is a very serious medical condition, but most people don’t know that the NIH Researchers have found a “significant relation” between full-blown periodontal disease and stroke. This is, in part, because periodontal disease is a major cause of tooth loss and people who have not teeth typically have the highest risk of stroke and cardiovascular death. Additional research makes it clear that tooth loss and the presence of gum disease are both associated with stroke occurrence. CDA studies show that there is a definite association between oral diseases and respiratory infections. This is especially true in cases of pneumonia and COPD (chronic obstructive pulmonary disease). Patients with gum disease are at risk of inhaling harmful bacteria into their lungs or having it travel to their lungs through their bloodstream. When you stop and think about it, it’s probably not super surprising that gum disease, an oral infection, has been linked to respiratory infections and illnesses like pneumonia. And the higher the concentration of adverse oral bacteria a patient has in their mouth, the greater their chances are that the bacteria will travel to other parts of their body including the lungs. For expectant mothers, it’s important to note that pregnant women who have gum disease may be more at risk of giving birth prematurely. Gum disease can also be linked to low birth weights for women who carry a baby to term. Bacteria from the oral infection can spread through the bloodstream to the developing child. And due to hormonal changes experienced during pregnancy, expectant mothers are often at higher risk of developing gum disease. Not surprisingly, lung cancer and esophageal cancer are more common than other cancers in patients with gum disease. The increased risk of cancer is compounded for patients with oral infections who smoke. As with heart disease, inflammation may be the link between gum disease and the increased rate of cancer. As you can see, gum disease has been linked to some pretty scary medical conditions. To help yourself maintain a lower likelihood of experiencing one of these medical problems, it’s important to seek professional help form a well qualified dentist who specializes in periodontal disease.